Yesterday's furious short squeeze in natural gas has seen an equal and opposite sell off today, with Natgas now unchanged from before yesterday's sharp ramp that sent the front contract higher by 20% only to see a 15% drop today. In addition to pairing of positions, Thursday’s decline was likely exacerbated by a report showing that producers had injected 39 billion cubic feet of gas into underground storage last week, higher than consensus estimates, bringing total stocks to 3.247tn cu ft. Still, stocks remained at the lowest level for this time of year since 2005, leaving the market vulnerable to fears about a weather-induced shortfall. While the catalyst behind the furious spike has yet to be confirmed, the severity of the price action prompted analysts and traders to speculate if one or more hedge funds were liquidating positions during a frantic week in global energy markets that saw gains for gas as crude oil prices took a dive. As we noted yesterday, the recent turmoil in the two commodities was likely due to a massive bearish positions in gas offset by longs in crude oil and "the unwinding of positions in one of these two commodities could potentially have triggered the opposite effect on the other commodity," Citigroup said. Indeed, as shown in the chart below, the 2-week rate of change in natgas vs WTI was the highest going back nearly 15 years. And as Bloomberg reported, for nat gas traders, Wednesday's price rally was so extreme that some were left comparing it to the turmoil that followed the notorious Amaranth blow-up 12 years ago. Gas futures rocketed up as much as 20 percent while there was an even bigger surge in the so-called widowmaker spread between two longer-dated contracts -- in effect a play on how big stockpiles will be at the end of winter. It’s the dramatic move in the spread that’s leading observers to draw parallels with the 2006 implosion of hedge fund Amaranth Advisors, which lost $6.6 billion following wrong-way nat gas trades by Brian Hunter. While so far there’s no suggestion of losses of that magnitude this time around, the gyrations set commodities markets abuzz. 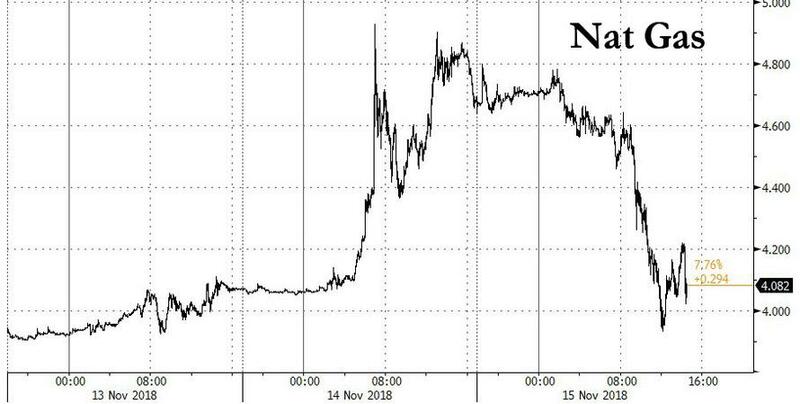 Whatever the reason behind the trade unwind, the CME took what it called "emergency action" to widen price fluctuation limits for eight nat gas futures contracts “in light of recent natural gas price movements." Meanwhile, volumes of benchmark Henry Hub natural gas futures on the Nymex were a record 1.6 contracts on Wednesday, more than four times the average. 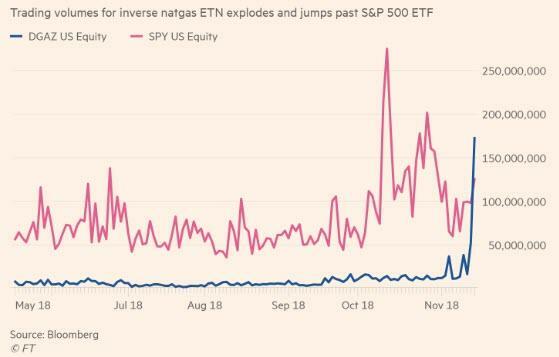 In fact, as the Financial Times reported, the volume was so ferocious that an ETN allowing retail investors to place leveraged bets on lower natural gas prices was more heavily traded than even the SPY, the world’s biggest ETF with $255bn of assets and the most traded equity security on the planet. What is notable is that the move in nat gas was so powerful, it nearly caused a VIXtermination-type event in the VelocityShares Daily 3X Inverse Natural Gas ETN, which seeks to produce three times the opposite daily move of US natural gas prices and is known by its stock market ticker DGAZ. Derivatives strategist Pravit Chintawongvanich, who rose to popularity with his hourly hot takes during the February VIXplosion that anihilated several inverse VIX ETNs, pointed out that DGAZ and its “long” leveraged cousin UGAZ could be liquidated if natural gas prices move sharply: "Because these products offer 3x daily leverage, a one day move greater than 33 per cent in either direction would blow up one of them," he wrote. In other words, the market was this close to another inverse ETN extinction event, only this time not in volatility but in natural gas. Meanwhile, the DGAZ's days may be limited: starting off the month with $500MM in assets, in just two weeks it has been cut in half, and as of this morning had just $247MM in assets.